With Valentine's day just around the corner, the spring issue has an overarching "love" theme! In this issue we give kudos to our spouses and partners who are supportive of our artistic businesses. Read on to hear how the couples we've interviewed successfully blend their businesses and relationships, and get some great advice on how to keep your spouse or partner on board whether they are into the artistic side or not! As face painters we have had endless stream of kids flow through our painting chairs, and we try our best to give them all a lovely experience. However, every child is unique in their own special way. 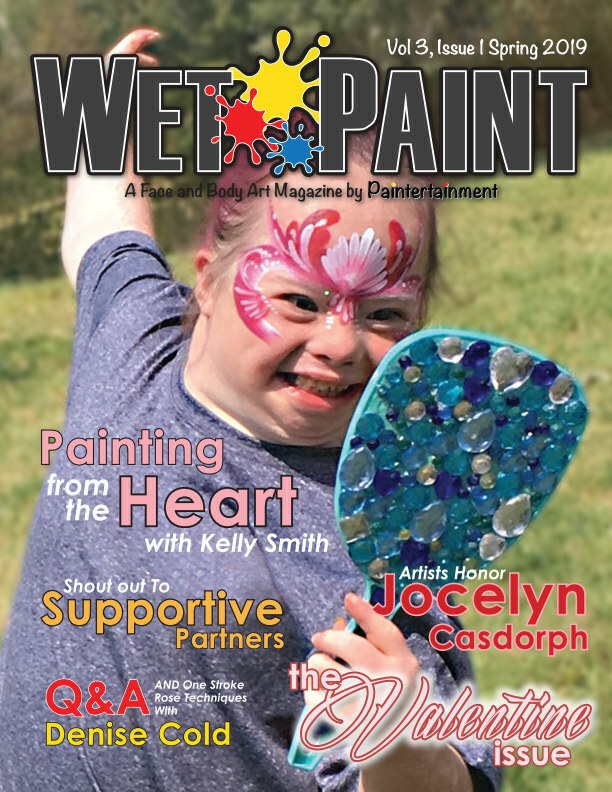 In this issue Kelly Smith shares ten simple yet impactful tips for painting kids who are on the spectrum or have other unique needs, and how we can ensure they too have the best experience possible! Just in time for Valentine's day, we are all sure to get requests for roses. So, for this issue we reached out to the one stroke rose queen herself, Denise Cold! Denise gives you simple, practical steps for ensuring your rose designs look both beautiful and realistic! Besides sharing her one stroke rose expertise, Denise has also graciously answered this issue’s “Pro Artist Q and A” session questions! This month we have Valentine themed step by steps, and a fun assortment of inspirational Valentine and Easter designs in our galleries. And speaking of inspiration, we have put together a beautiful tribute to Heaven’s latest artistic angel, Jocelyn Casdorph. Thank you to the artists who submitted their portraits of Jocelyn to our collage!